Layers of gorgeousness here! 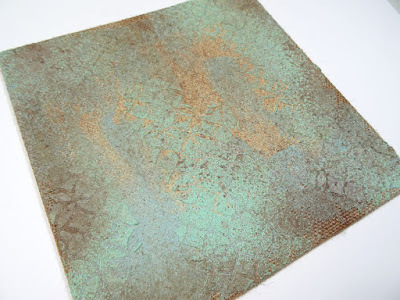 LOVE the tones throughout the whole canvas too! The metal bits are perfect! Your canvas is beautiful, Annette. All of the color is just so refreshing! I love your use of so many Ideaology elements. 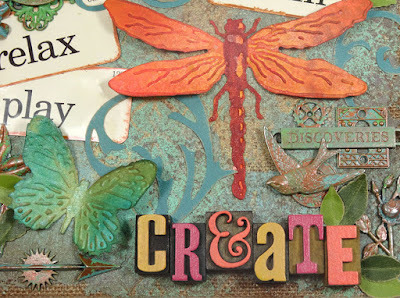 "Create" is so cute! I also loved Richele's use of the ampersand. So clever! I really love this, Annette. oh my wow! your canvas is FAB-U-LOUS! 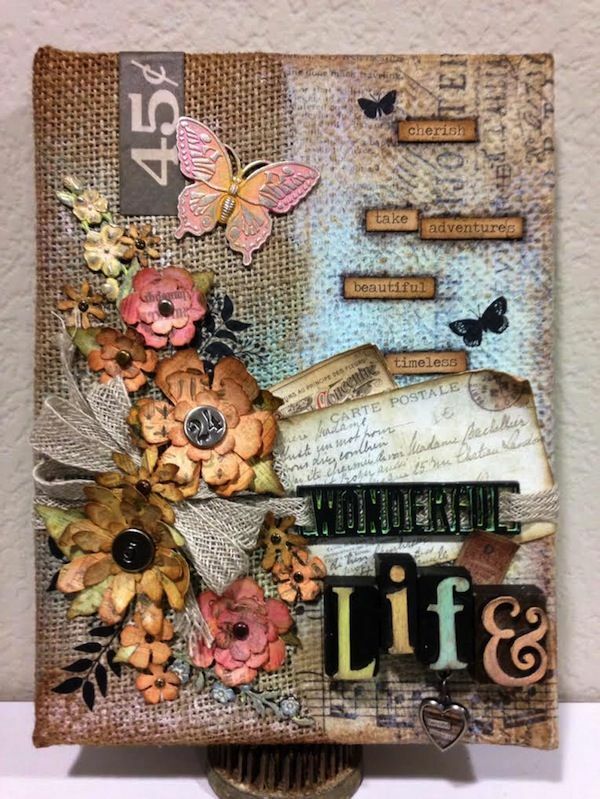 LOVE every little detail and all the altered surfaces are over the top gorgeous...I especially love the metal butterfly...that looks amazing with the technique! Bravo! Big hugs sweets! Love the finish on your metal pieces and the pops of color in your canvas. Very pretty and what interesting color choices! I never would have chosen them myself, but they really work well together and have a great impact. I think my favorite part is that gorgeous metal butterfly. Can't wait to try this technique; thanks so much for the awesome inspiration! Beautiful piece of art work Annette! Lovely colors! What a difference the sprays made on your canvas background. Thanks for the before and after spray photos. This is a beautiful canvas and will look lovely on your wall. I can't believe CC3C is almost over. Your canvas is amazing ... I love how you used/embellished the various alterable surfaces... had fun identifying them all... the create is fun too ! That background ... OMG amazing technique to get that look... WOW! Ooh thes colors are just yummy. Great piece. 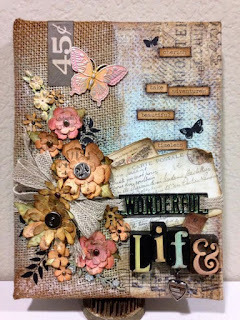 FABulous canvas, Annette! I really love the contrast of your bright letterpress letters and the grungy, aged metal pieces. 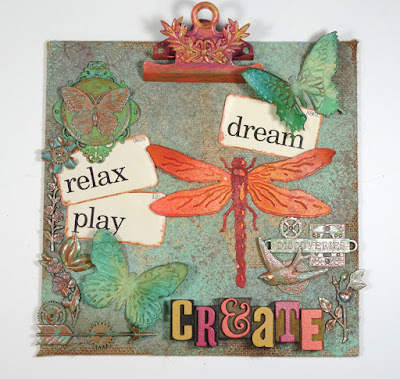 Love the "relax, play, create" message and the building your your textured layers. Your tutorials are always so well done. Most lovely, my friend! 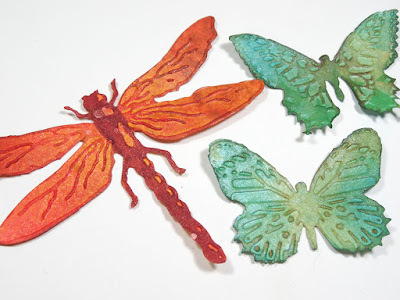 How could I not love something with both butterflies and dragonflies? The piece is trult art worthy of display! Love all your layers! Beautiful work! This is so pretty Annette!I love the colors you used and how well they work with the technique! Wow, Annette, I think this is one of my favorite pieces you have done! 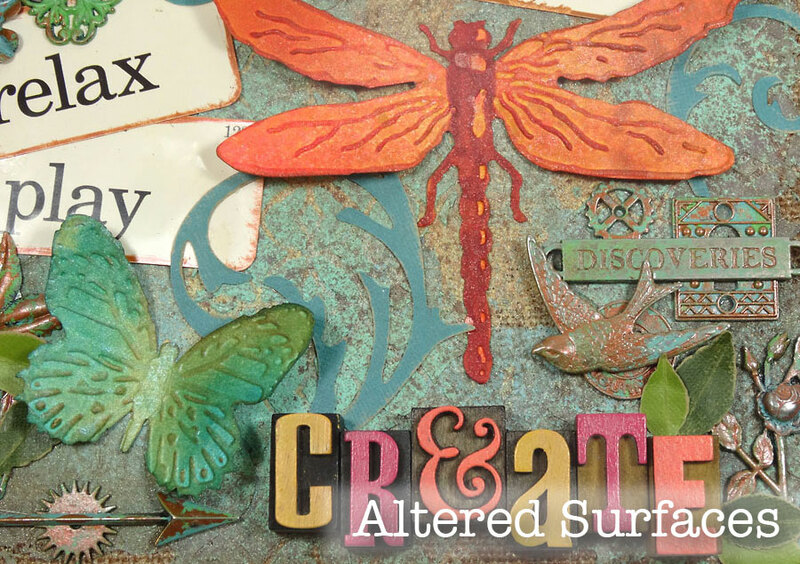 I love the canvas along with the wonderful colors and amazing altered surfaces! Fabulous! How fabulous! I love your wall art and the fantastic job you did on the metal embellies and your word. Super! 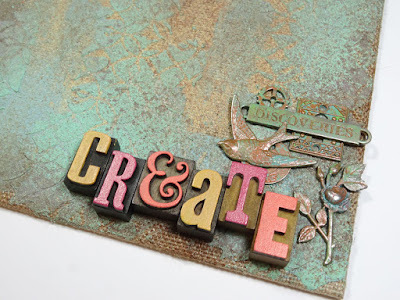 love what you did with the metal pieces!! fantastic canvas! I Love this!! From the perfect background, to the bird and vine in the lower right!! Absolutely beautiful! Wonderful addition to your wall. 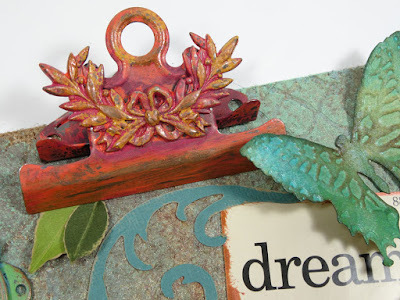 The colors are vintage and a bit grungy. The altered metal adds a nice touch. Love that some of the burlap is peeking through all the yummy layers. What a COLORFUL, eye-catcher of a creation!!! Your canvas literally shows the relaxing time you had creating it, and the use of the '&' is an idea I also love!!! Beautiful canvas, for me it's so perfect that it would not add glossy accent. 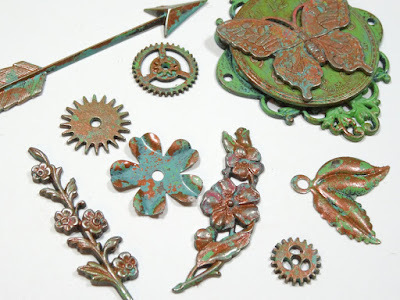 This is so beautiful, the colours are really restful and dreamy and the metal pieces are lovely. 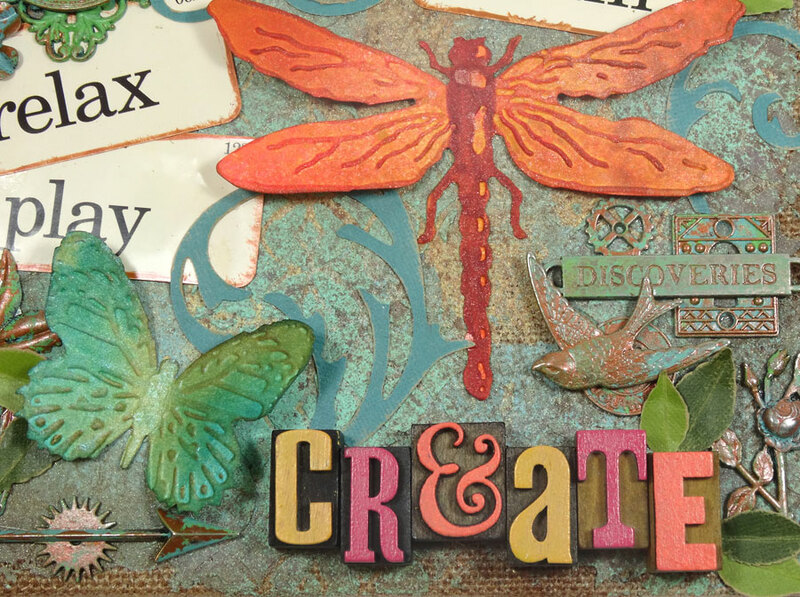 What a wonderful piece from the background to the dragonfly to the metal pieces. So perfect. Love it! 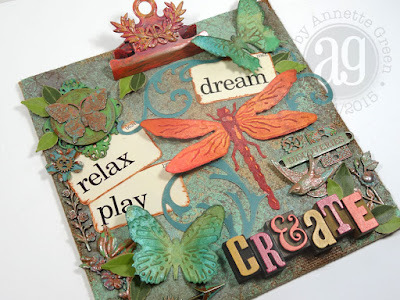 Your altered surfaces are soooooooooooooooooooooooooooooooooo BEAUTIFUL Annette. Love your entire creation. But... dragonflies are one of my fav things and yours is LOVELY. This just makes me feel happy. Thanks bunches for a great way to end my day. j.
I love your beautiful color contrast with the greens and oranges. 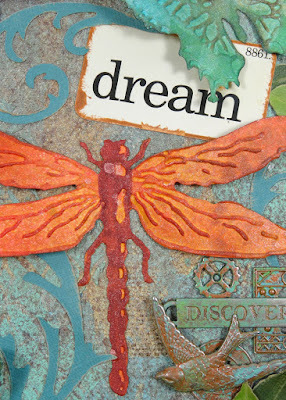 The design on the clip is so cool, and the dragonfly is awesome! Beautiful canvas, Annette! Your background is fabulous, and all those elements are just perfectly placed. I love that you have altered metal surfaces--who'da thunk? These look so rich with the colors you chose! Really pretty! Hugs! I LOVE the colors! fabulous! 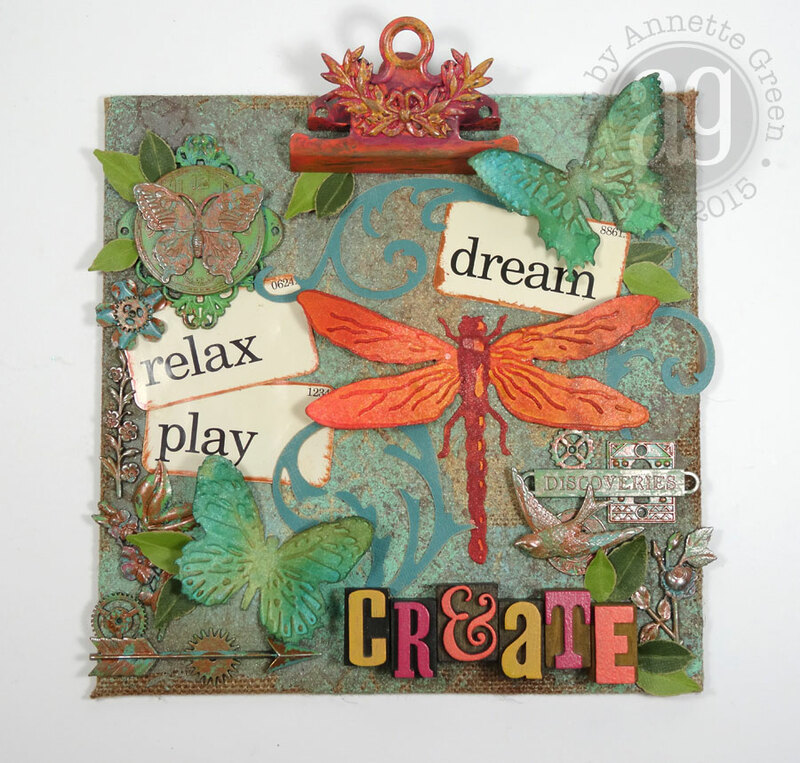 Love the colors you used on this project Annette! This is awesome!! 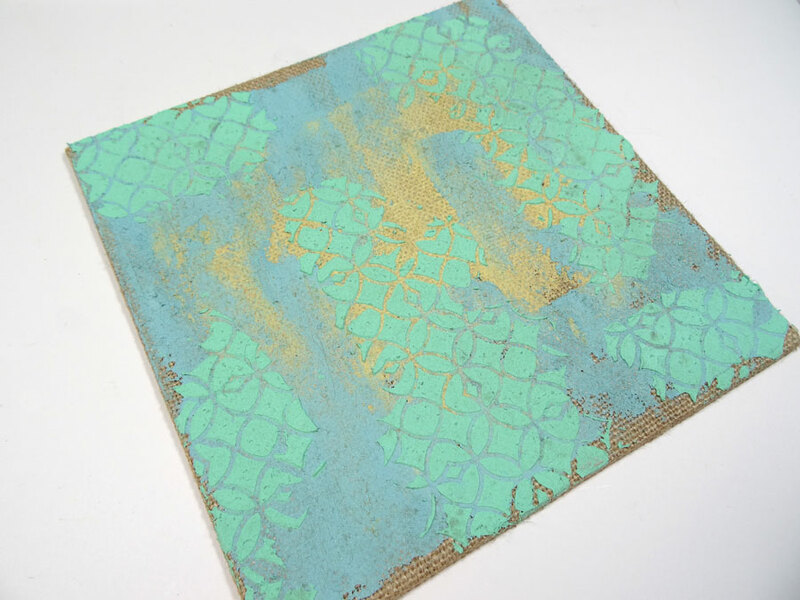 Annette, Your burlap canvas is beautiful. 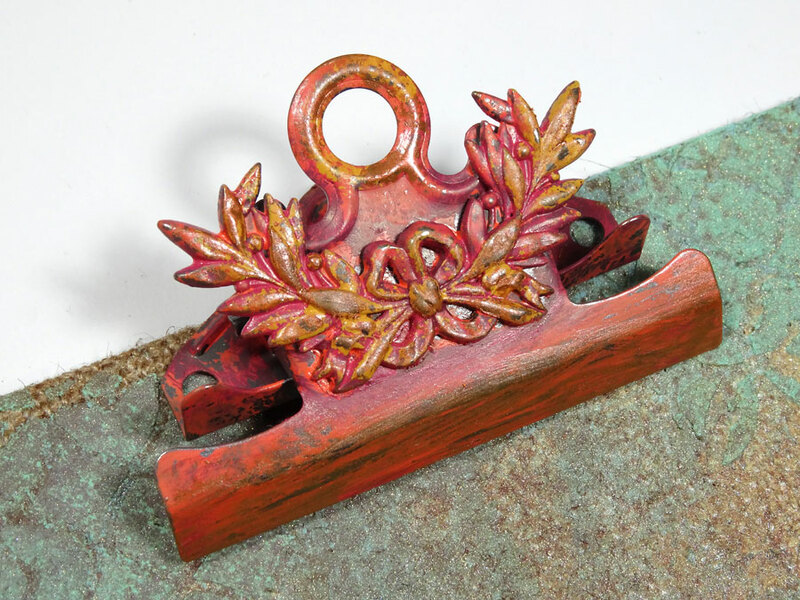 I love how you used the technique on a variety of surfaces and the colors are so rich and bright. Wow! 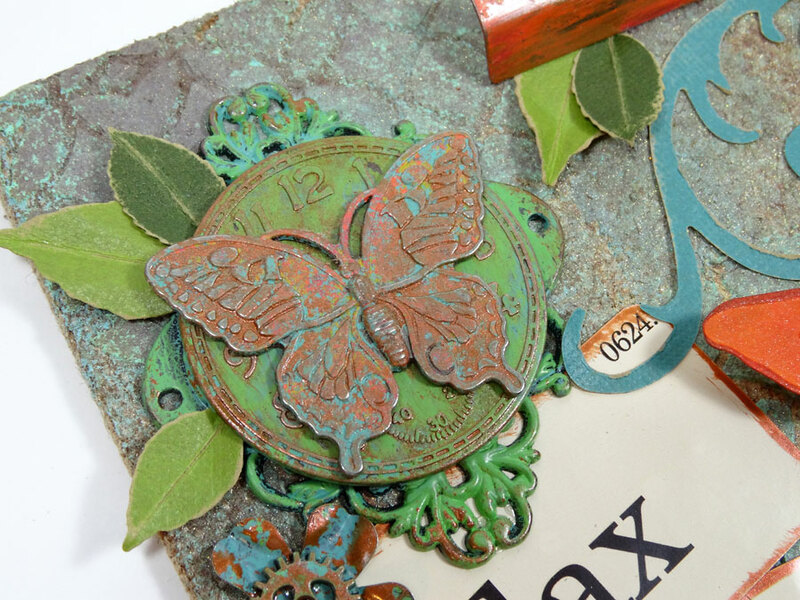 Such layering and details! My favourite area is the bottom cluster with the title. 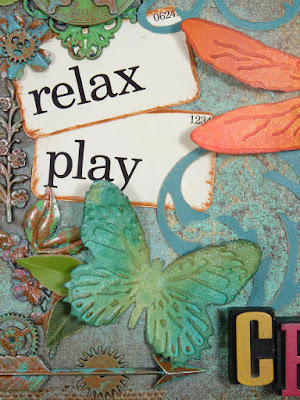 I like how you used that E like in the inspiration canvas and the colours that you used on the wood blocks.